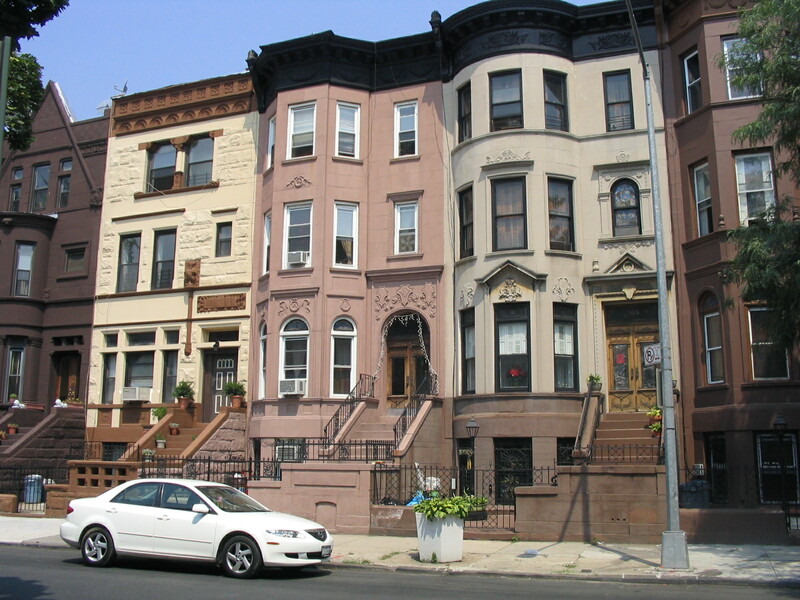 How can tech support housing rights in Brooklyn? Our April 16th Technology Salon Brooklyn, co-hosted with the Brooklyn Community Foundation (BCF) and AfroLatin@ Project explored the issue of tenant rights within the wider context of structural discrimination. We aimed to think about how new technology and social media might be a tool for helping community organizations to support Brooklyn residents to know their rights and report violations. We were also curious about how better use of data (and ‘big data’) might help housing rights activists and community organizations to more successfully engage residents and advocate for change. Our lead discussant was David Reiss from Brooklyn Law School, who provided an overview of the wider housing market and challenges in New York City as well as information on some applications that are helping landlords do a better job of keeping properties up to standard. We also heard from Tynesha McHarris (BCF) and Amilcar Priestly (AfroLatin@ Project). She noted that technology is a tool with potential, and donors could be funding projects that use tech to help organize and advocate on tenant rights, but there is insufficient evidence to know how to approach it. To date technology has not really been part of the bigger picture. Another discussant talked about the housing market as a whole in New York City, citing that there available affordable housing has not kept up with the huge influx of population over the past several years. “Technology will not fix the underlying problem,” he noted. “It can’t expand the supply of affordable housing.” The real potential for technology is more in helping protect the rights of current tenants. Some examples of how tech is supporting housing rights include applications and portals aimed at improving communications between landlords and tenants, so that problems can be more easily reported by either side, and record is kept of complaints, he commented. Incentives for landlords include free advertising of their units on the site and some reduced legal fees for things like rent stabilization approval. An interesting aspect of these sites is that the data can be analyzed to see where the largest number of complaints are coming from, and in this way patterns can be found and identified. For example, who are the bad landlords? Other sites offer lots of data for those who are interested in purchasing units, and this same type of data could be repurposed and made more accessible for lower-income and less technologically savvy residents. One participant noted that gentrification and policing are very connected. “As we talk about legal rights and landlord-to-tenant conversations,” she noted, “we need to also bring in aspects of policing and racial justice. These are closely linked.“ As neighborhoods gentrify, newer residents often call for a greater police presence, and this can lead to harassment of long-time residents. What other roles could technology play in strengthening existing work? Lots of community organizations are working on the issues of tenant rights and gentrification, and there is a desire to build a network across these organizations. 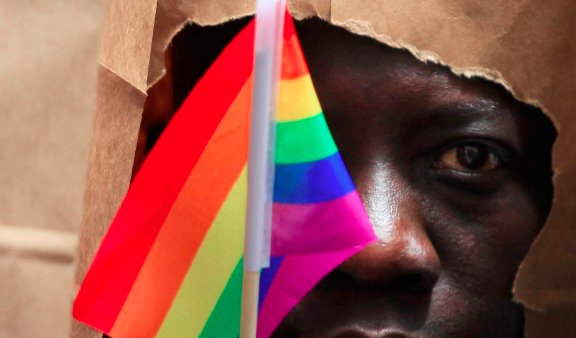 Tech could help to bring them together and to support stronger advocacy and organization. People don’t always know where they can go for help. One idea was to map organizations in different neighborhoods where people can go for help on housing issues. People also may think that they are the only tenants in a building who are having trouble with a landlord. Improved communication via tech might help let residents know they are not alone and to reduce the fear of reporting and speaking out about housing violations. One idea was to use the new system of NYC neighborhood domains to provide local information, including housing rights and specific information on buildings and their histories. Tech can offer different dissemination channels for different people – for example, in Detroit the elderly are particularly vulnerable to housing violations, said one Salon participant. One organization encourages people to report housing harassment via SMS. They included a call-back option to cater to older people who did not feel comfortable with SMS. Stories are also an important part of campaigns and public awareness, noted another participant. Sandy Storyline created a way to share text plus a photo via SMS for those who wanted to communicate stories but who were offline. This type of application could serve as a way of keeping record of housing violations, when/where they are reported and what the outcomes are. One way that tech is already helping is by tracking whether public housing buildings have heat and water. Sensors are attached to the buildings, and the information is sent to journalists who then write stories when building violations happen, mentioned one Salon participant. This could be accompanied by text messages out to residents of these buildings to inform them of the status of their building. Knowing that they are not the only ones noticing problems could help residents feel more confident about speaking out and confronting bad landlords. “It’s information that says to someone: ‘this message it not only for you, it’s for everyone in your building, and here is the number you can call to get support or if you fear retribution for reporting.’” Media attention puts pressure on landlords and can help bring violations to light and make people feel safer reporting them. A study in Kenya found that youth tend to bypass local politicians and pay more attention to national government and governance. Similar trends are found in the US where although local political decisions may impact more directly on residents fewer are involved in or aware of local political processes than national ones. Tech could play a role in helping connect residents to local representatives who could take action to support fair housing, address bad landlords, and support longer-term solutions as well. Some local political offices have been very open to integrating technology into their work, said one participant, and these offices might be good places to think about partnering on initiatives that use technology to better connect with their constituencies. Mapping and big data sets are providing investors with incredible amounts of information on where to purchase and invest. How can organizations and advocates better use this information, not just to identify movement and displacement and conduct research on it, but also to predict it, prepare for it, and fight it together with residents? How is information that data scientists and research institutes have, as well as open data sets on New York City used by local organizations, some wondered, and where could it be better brought to bear? “Rather than coming up with parallel studies, how can we advocate for more and better open data from New York City on housing?” asked one participant. Some people and politicians are pushing to make things like police videotaping illegal. This happened recently in Spain with the so-called “Citizen Security” law that has made it illegal to videotape a police officer in some cases. One discussant mentioned that some US Senators are also trying to restrict the rights of citizens to film police, and that advocates of social justice need to fight to keep these rights to document authorities. In order to understand what tech tools might be useful, it we need to understand the communication and technology landscape in which we are working. Though Salon participants mentioned the importance of certain print publications, community radio stations in various languages, and increasing use of smart phones by young people, no one was aware of any current and widespread information on the information and communication habits of residents of Brooklyn that could help to target particular outreach efforts to different groups who were at risk of housing violations. 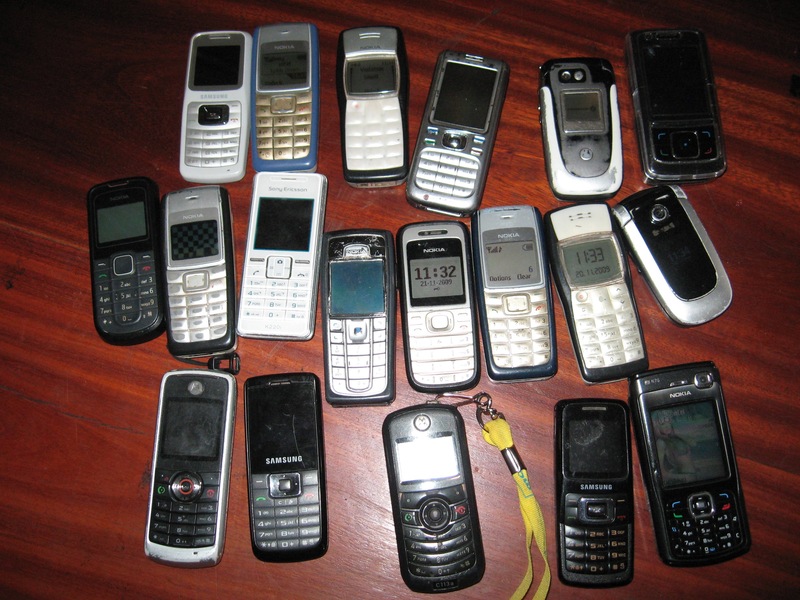 SMS can be extremely accessible, and there are many examples where it has worked very well. But experience shows that SMS works best where there are already strong networks in place, and trust is hugely important. One participant cautioned, “People need to trust where the text message is coming from. They need to know who is sending the text.” SMS also has limits because it is hyper local. “You won’t find it working across an entire Borough,” said one participant. Because youth around the world, including in Brooklyn, tend to be up on the latest technology, they could play a role in helping parents and grandparents with housing rights violations, especially in communities where older people are not comfortable with English or where they may fear the police due to undocumented status or other past experiences. One idea was bridging the technology and age gap by engaging young people, who could help older people find out about their rights, legal support services and where to find help. Some research has shown that young people are starting to rely on technology as an institution, said one participant, with technology and online institutions replacing physical ones for many of them. As with any tech project, creating demand for services and informing people about the existence of those services is often an easier task than building and sustaining the capacity to provide quality support. Any efforts to generate greater demand need to be accompanied by capacity and funding so that people do not become apathetic or feel that they’ve been tricked if they report a violation and do not receive the support they expect or were promised. Previous experiences with service providers or legal institutions will also impact whether people trust these efforts, even if they come through new channels like technology. In conclusion, participants expressed their interest in continuing discussions and a desire for greater participation by community organizations in future Salons. The hope is that the Salon can help to connect community organizations and those in the tech space in order to work together to address some of the issues that Brooklyn residents face. If you’d like to join us for our next Salon, sign up here. Many thanks to the Brooklyn Community Foundation for their fabulous hosting and AfroLatin@ Project for helping make the Salon happen! This is a guest post from Anna Crowe, Research Officer on the Privacy in the Developing World Project, and Carly Nyst, Head of International Advocacy at Privacy International, a London-based NGO working on issues related to technology and human rights, with a focus on privacy and data protection. Privacy International’s new report, Aiding Surveillance, which covers this topic in greater depth was released this week. New technologies hold great potential for the developing world, and countless development scholars and practitioners have sung the praises of technology in accelerating development, reducing poverty, spurring innovation and improving accountability and transparency. Worryingly, however, privacy is presented as a luxury that creates barriers to development, rather than a key aspect to sustainable development. This perspective needs to change. New technologies are being incorporated into development initiatives and programmes relating to everything from education to health and elections, and in humanitarian initiatives, including crisis response, food delivery and refugee management. But many of the same technologies being deployed in the developing world with lofty claims and high price tags have been extremely controversial in the developed world. Expansive registration systems, identity schemes and databases that collect biometric information including fingerprints, facial scans, iris information and even DNA, have been proposed, resisted, and sometimes rejected in various countries. The deployment of surveillance technologies by development actors, foreign aid donors and humanitarian organisations, however, is often conducted in the complete absence of the type of public debate or deliberation that has occurred in developed countries. Development actors rarely consider target populations’ opinions when approving aid programmes. Important strategy documents such as the UN Office for Humanitarian Affairs’ Humanitarianism in a Networked Age and the UN High-Level Panel on the Post-2015 Development Agenda’s A New Global Partnership: Eradicate Poverty and Transfer Economies through Sustainable Development give little space to the possible impact adopting new technologies or data analysis techniques could have on individuals’ privacy. Some of this trend can be attributed to development actors’ systematic failure to recognise the risks to privacy that development initiatives present. However, it also reflects an often unspoken view that the right to privacy must necessarily be sacrificed at the altar of development – that privacy and development are conflicting, mutually exclusive goals. and that respecting privacy comes at a high cost, endangering the success of development initiatives and creating unnecessary work for development actors. These assumptions are deeply flawed. While it should go without saying, privacy is a universal right, enshrined in numerous international human rights treaties, and matters to all individuals, including those living in the developing world. The vast majority of developing countries have explicit constitutional requirements to ensure that their policies and practices do not unnecessarily interfere with privacy. The right to privacy guarantees individuals a personal sphere, free from state interference, and the ability to determine who has information about them and how it is used. Privacy is also an “essential requirement for the realization of the right to freedom of expression”. It is not an “optional” right that only those living in the developed world deserve to see protected. To presume otherwise ignores the humanity of individuals living in various parts of the world. Technologies undoubtedly have the potential to dramatically improve the provision of development and humanitarian aid and to empower populations. However, the privacy implications of many new technologies are significant and are not well understood by many development actors. The expectations that are placed on technologies to solve problems need to be significantly circumscribed, and the potential negative implications of technologies must be assessed before their deployment. Biometric identification systems, for example, may assist in aid disbursement, but if they also wrongly exclude whole categories of people, then the objectives of the original development intervention have not been achieved. Similarly, border surveillance and communications surveillance systems may help a government improve national security, but may also enable the surveillance of human rights defenders, political activists, immigrants and other groups. Asking for humanitarian actors to protect and respect privacy rights must not be distorted as requiring inflexible and impossibly high standards that would derail development initiatives if put into practice. Privacy is not an absolute right and may be limited, but only where limitation is necessary, proportionate and in accordance with law. The crucial aspect is to actually undertake an analysis of the technology and its privacy implications and to do so in a thoughtful and considered manner. For example, if an intervention requires collecting personal data from those receiving aid, the first step should be to ask what information is necessary to collect, rather than just applying a standard approach to each programme. In some cases, this may mean additional work. But this work should be considered in light of the contribution upholding human rights and the rule of law make to development and to producing sustainable outcomes. And in some cases, respecting privacy can also mean saving lives, as information falling into the wrong hands could spell tragedy. While there is an increasing recognition among development actors that more attention needs to be paid to privacy, it is not enough to merely ensure that a programme or initiative does not actively harm the right to privacy; instead, development actors should aim to promote rights, including the right to privacy, as an integral part of achieving sustainable development outcomes. Development is not just, or even mostly, about accelerating economic growth. The core of development is building capacity and infrastructure, advancing equality, and supporting democratic societies that protect, respect and fulfill human rights. The benefits of development and humanitarian assistance can be delivered without unnecessary and disproportionate limitations on the right to privacy. The challenge is to improve access to and understanding of technologies, ensure that policymakers and the laws they adopt respond to the challenges and possibilities of technology, and generate greater public debate to ensure that rights and freedoms are negotiated at a societal level. Technologies can be built to satisfy both development and privacy. Download the Aiding Surveillance report. The November 14, 2012, Technology Salon NYC (TSNYC) focused on ways that ICTs can support work with children who migrate. An earlier post covers the discussion around Population Council’s upcoming ‘Adolescent Girls on the Move’ report. The current post focuses on the strategic use of data visualization for immigration advocacy, based on opening points from Brian Root and Enrique Piracés of Human Rights Watch (HRW). Visualizing the US Detention Network and the transfers between detention centers. The HRW initiative used data to track and visualize the movement of people through the US immigration detention system after noticing that U.S. Immigration and Customs Enforcement (ICE) was moving people very freely without notifying their families or attorneys. HRW was aware of the problem but not its pervasiveness. The team obtained some large data sets from the US government via Freedom of Information Act (FOIA) requests. They used the data to track individuals’ routes through the immigration detention system, eventually mapping the whole system out at both aggregate levels and the level of individual. The patterns in the data informed HRW’s advocacy at the state and federal levels. In the process, HRW was able to learn some key lessons on advocacy and the importance of targeting data visualizations to specific advocacy purposes. The data set HRW obtained included over 5.4 million records of 2.3 million people, with 10-12 variables. The team was able to connect these records to individuals, which helped tell a meaningful story to a broad audience. By mapping out all the US facilities involved and using geo-location to measure the distance that any individual had been transferred, the number of times an individual from Country X in Age Range X was transferred from one facility to another was visible, and patterns could be found. For example, often people on the East Coast were transferred to Texas, where there is a low ratio of immigration lawyers per detainee. Even though the team had data and good stories to tell with the data, the two were not enough to create change. Human rights are often not high priority for decision makers, but budgeting is; so the team attached a cost to each vector that would allow HRW to tell decision makers how much was being spent for each of these unnecessary transfers. They were also able to produce aggregated data at the local level. They created a state dashboard so that people could understand the data at the state level, since the detention facilities are state-run. The data highlighted local-level inefficiencies. The local press was then able to tell locally relevant stories, thus generating public opinion around the issue. This is a good example of the importance of moving from data to story telling in order to strengthen advocacy work. HRW conveyed information and advocated both privately and publicly for change in the system. Their work resulted in the issuing of a new directive in January 2012. Obtaining data via FOIA acts can be quite difficult if an organization is a known human rights advocate. For others it can be much easier. It is a process of much letter sending and sometimes legal support. Because FOIA data comes from the source, validation is not a major issue. Publishing methodologies openly helps with validation because others can observe how data are being used. In the case of HRW, data interpretations were shared with the US Government for discussion and refutation. The organization’s strength is in its credibility, thus HRW makes every effort to be conservative with data interpretation before publishing or making any type of statement. One important issue is knowing what data to ask for and what is possible or available. Phrasing the FOI request to obtain the right data can be a challenge. In addition, sometimes agencies do not know how to generate the requested information from their data systems. Google searches for additional data sets that others have obtained can help. Sites such as CREW (Citizens for Responsibility and Ethics in Washington), which has 20,000 documents open on Scribd, and the Government Attic project, which collects and lists FOI requests, are attempting to consolidate existing FOI information. The type of information available in the US could help identify which immigration facilities are dealing with the under-18 population and help speculate on the flow of child migrants. Gender and nationality variables could also tell stories about migration in the US. In addition, the data can be used to understand probability: If you are a Mexican male in San Jose, California, what is the likelihood of being detained? Of being deported? The US Government collects and shares this type of data, however many other countries do not. Currently only 80 countries have FOI laws. Obtaining these large data sets is both a question of whether government ministries are collecting statistics and whether there are legal mechanisms to obtain data and information. Several steps and tools helped HRW with data parsing. To determine whether data were stable, data were divided by column and reviewed, using a SHELL. Then the data were moved to a database (MySQL), however other programs may be a better choice. A set of programs and scripts was built to analyze the data, and detention facilities were geo-located using GeoNames. The highest quality result was used to move geo-location down to the block level and map all the facilities. Then TileMill and Quantum GIS (QGIS) were used to make maps and ProtoViz (now D3) was used to create data visualizations. Once the data were there, common variables were noted throughout the different fields and used to group and link information and records to individuals. Many individuals had been in the system multiple times. The team then looked at different ways that the information could be linked. They were able to measure time, distance and the “bounce factor”, eg.., how many times an individual was transferred from one place to the other. Highlighting problematic cases: One man’s history of transfers. Remember the goal. Visualization tools are very exciting, and it is easy to be seduced by cool visualizations. It is critical to keep in mind the goal of the project. In the HRW case the goal was to change policy, so the team needed to create visualizations that would specifically lead to policy change. In discussions with the advocacy team, they defined that the visualizations needed to 1) demonstrate the complexity 2) allow people to understand the distance 3) show the vast numbers of people being moved. Privacy. It is possible to link together individual records and other information to tell a broader story, but one needs to be very careful about this type of information identifying individuals and putting them at risk. For this reason not all information needs to be shared publicly for advocacy purposes. It can be visualized in private conversations with decision makers. Open data, open source, data visualization, and big data are shaping the world we are embedded in. More and more information is being released, whether through open data, FOIA or information leaks like Wikileaks. Organizations need to begin learning how to use this information in more and better ways. Many thanks to the Women’s Refugee Commission and the International Rescue Committee for hosting the Salon. The next Technology Salon NYC will be coming up soon. Stay tuned for more information, and if you’d like to receive notifications about future salons, sign up for the mailing list! I like to share good training guides when I come across them, so here is a quick summary and a link to Bamboo Shoots. It was originally created by Plan in Cambodia. 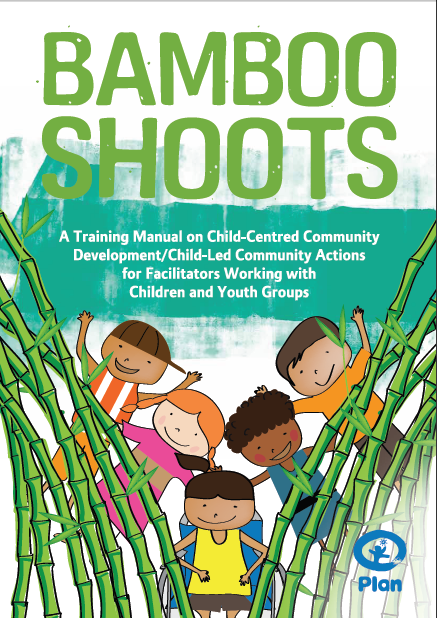 Bamboo Shoots is a training manual on child rights, child centered community development and child-led community actions for facilitators working with children and youth groups. You can download it here. Bamboo Shoots was developed to: Increase children’s understanding of their rights as defined by the United Nations Convention on the Rights of the Child (UNCRC); raise children’s awareness of their rights and build their capacities to claim them; create opportunities for children to recognize, identify and prioritize issues and problems or gaps in relation to child rights violations; and provide opportunities for children to influence agendas and action regarding identified and prioritized child rights violations. Bamboo Shoots takes complicated concepts and breaks them down into easy language and engaging, interactive sessions. It also offers good resources and background material for facilitators so that they can manage the sessions well. I like this manual because it starts off right in the first chapter with the importance of setting the tone and the context for good child and youth participation. It provides ideas on selecting participants and facilitators, and gives a description of a good facilitator. It provides recommendations on the setting and practical considerations for managing a workshop with children, as well as good paragraph to help think through when and when not to include other adults in the training. It shares Plan’s code of ethics on child participation and important steps to follow in working with children, as well as tips on how to establish a good working relationship with children, how to help children learn and develop their potential, how to help children build self-confidence and self-esteem, and how to encourage children to develop a responsible attitude towards others and a sense of community. There is a section on how to keep children safe also and an explanation of a facilitator’s ‘duty of care’. A last section of part one lists common facilitation techniques and tools, such as: role-play, working in pairs and groups, idea storming, whole group discussion, questioning, projects, buzz sessions, drawing, photographs, video, word association, recreating information and more; and gives ideas on when they are most useful. Each session comes complete with a pre-training assessment, reading material for facilitators and handouts for participants. The last section of the manual helps facilitators take children through the steps to child-led community action, including children’s participation in all the program and project cycles: assessment, planning, implementation, monitoring and evaluation. 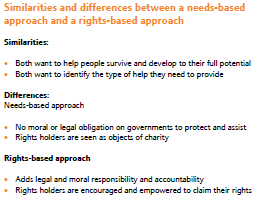 It also explains Plan’s rights-based child-centered community development approach, the foundations of that approach, and the difference between needs-based approaches and rights-based approaches. It goes on to cover planning and supporting child-led community action. The last section of the guide offers a list of resources and references. 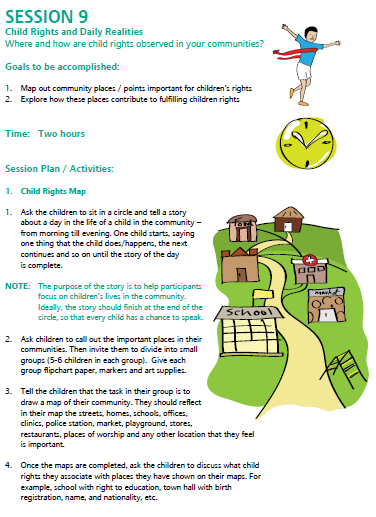 For anyone working with children, or even anyone looking for an excellent comprehensive community training package on rights and community-led action, I really recommend checking out Bamboo Shoots. Whether you are working through media and ICTs or using more traditional means for engaging children, this is a great guide on how to do it well from start to finish. I’ll be referring to it often.